On March 14th we will be releasing our next update, New Assignment. This update will be available on PC, PlayStation®4, and Xbox One. The size of the patch will be 4 GB on Steam, 15 GB on Uplay and up to 15 GB on consoles depending on your version. Please note that you will need to restart and update your platform to be able to play online. 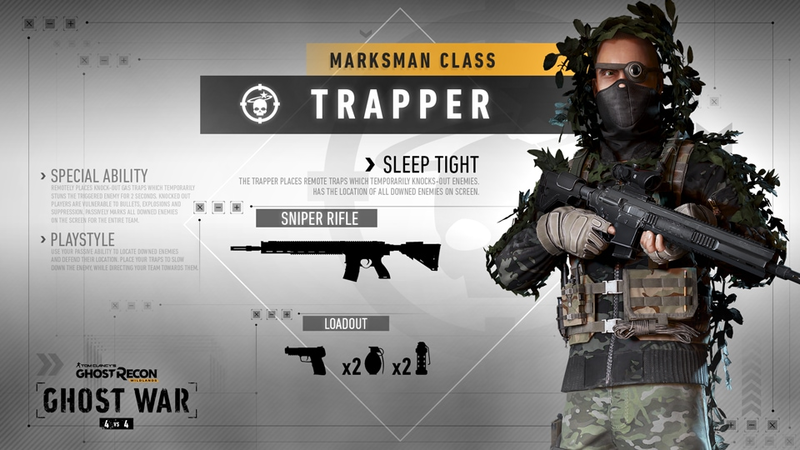 New Assignment will bring a range of new content to Ghost War, including three new classes, Trapper, Stalker and Guerrilla. We have also introduced a new map-voting tool, allowing players to vote for one of three possible maps at the start of every match. 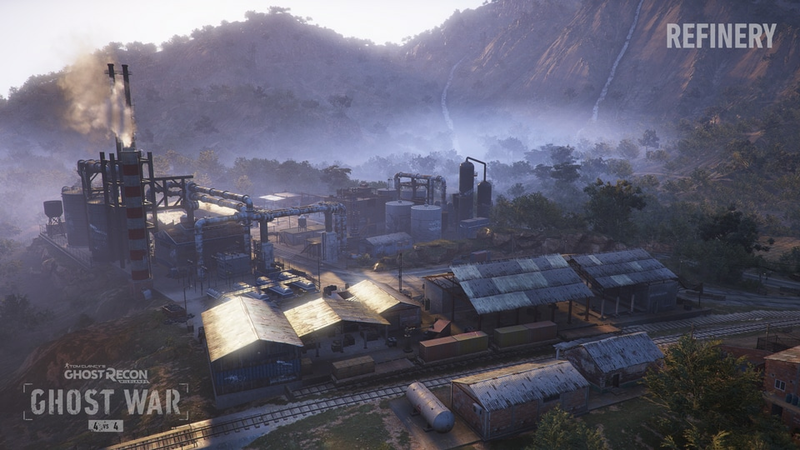 We have also added two new maps, Refinery and Cliffside, for Extraction mode. For our Campaign mode, we have exclusively added more Fallen Ghosts weapons. Additionally, our Rainbow Six Siege Icons can be now collected via both our Ghost War and Spec Ops Crates, meaning they are available for customization in Ghost War as well as our Campaign. 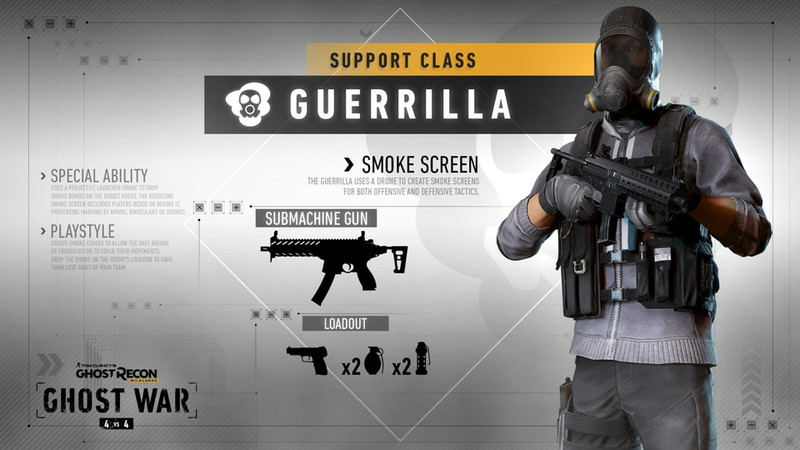 The Guerrilla is a Support class with a drone that can shoot smoke grenades. All players inside of the smoke radius are occluded, meaning they become unmarked if they were marked, and additionally drones, aiming or binoculars cannot mark them. 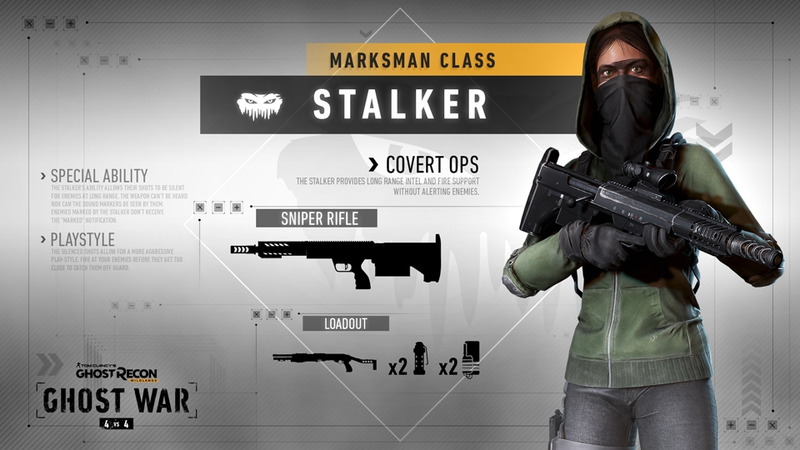 The smoke can have many tactical uses, from creating a safe cover, to reviving downed teammates and to temporarily blinding an enemy sniper. - Tech: The Tech's jammer will not appear on the HUD for the enemy team anymore, as this was giving away the Tech's position. Now the Tech can safely place a jammer without being exposed. - Mine Defusing: We have introduced the ability for players to defuse enemy mines. By approaching the mine while prone, the mine's detonation range is reduced, allowing you to safely get closer to the mine until the "defuse" prompt appears. Defusing a mine will remove it without alerting its owner. - Ruins Map: We have reworked the Ruins map to improve its balance. The playable area has been expanded, we added more cover for crossing certain key locations and we relocated most objects on the map, including the spawn locations. - Institute Map: We changed the Attackers spawn position to add more variety to the map, and moved the hostage cages closer to each other so the Defenders team can move faster from one hostage to the other. - Penalties: Penalty timeouts have been reduced, as they were too long and severely punished players who were experiencing connection issues. - Prestige Credits: There was a big discrepancy between players with high Prestige level and players with low Prestige level, concerning the amount of Prestige Credits they earned per level-up. To address this, we now award a flat value of 215 Prestige Credits, no matter the Prestige level (the total sum remains the same). We also gave players the extra amount of Prestige Credits they should have earned with this new system in place, so that everyone now has the correct amount. - New Tutorial Info: Our tutorials have been updated to include changes to existing features and the introduction of our new classes. Knowledge is power, so make sure you read them! - Fixed an issue where a Player would spawn with his Camera view on the enemy's side. - Fixed an issue with the missing sound for a marked Hostage. - Fixed an issue with a Russian wrongly translated word on the Victory screen. - Fixed an issue with some words not being localized on the Ranked Season End pop-up. - Fixed an issue with the Total Time Played, from the Stats page, not showing properly for the Users with a high amount of played time. - Fixed an issue with a word from the Stats page not being translated. - Fixed an issue where the Users couldn't be marked when looked at through a window from a Gas Station on the Urban Incursion map. - Fixed an issue with a message not being displayed when a Defender would make a First Blood on an enemy Player holding the Hostage. - Fixed an issue with the "Current rank league", from the Stats page, not being reset when a new season starts. - Fixed an issue with the Jammer icon not showing properly after a Host Migration. - Fixed an issue where the Ping icon on the HUD would now be grayed-out during cooldown. - Fixed an issue with a no-functionality "Cancel Search" button appearing during a Loading Screen. - Fixed an issue where the unlocking cage animation played twice when opened by a Pathfinder. - Fixed an issue where the Ranked-tutorial page wasn't displaying the updated information regarding the Placement Matches. - Fixed an issue with a message not correctly informing the Party Leader when leaving a Ranked match with his squad. - Fixed an issue where the User wasn't notified, regarding his Rank, after completing the placement rounds. - Fixed an issue where the Diversionist's Drone was automatically marked on the HQ App. - Fixed an issue where the Hostage would have a looping animation after the Attacked was killed while grabbing him. - Fixed an issue with some reinforced windows through which only the 1st throwable passed. - Fixed an issue with a building, from the Institute map, with faulty collision. - Fixed an issue where the Players that abandoned a match during "Probation Time" wouldn't get penalized. - Fixed an issue with the Pathfinder not being marked via binoculars. - Fixed an issue with some text overlapping, on various localizations, on the Battle Crates page. - Fixed an issue where some Party members would not be able to search for a Quickplay/Ranked match. - Fixed some clipping issues occurring when the Tracker t-shirt was equipped, by female characters, underneath vests. - Fixed an issue where the User would accidentally Ping when clicking on the Notification button from the Tacmap. - Fixed some text overlapping issues, on the Progression page, on various localizations. - Fixed an issue with some of the words, from the Stats page, not being translated into Italian. - Fixed an issue with Users playing on the same side, twice in a row, if a Player would leave in a certain moment. - Fixed an issue, on the Extraction mode, where the Hostage-Cage icons were not properly shown on the HUD. - Fixed an issue where the Users couldn't Ping anymore after being revived by the Medic's Drone. - Fixed an issue with the M16's SFX volume being too low. - Fixed an issue where the User would receive a "Rank Up!" notification even when his rank remains unchanged. - Fixed an issue where the Hostage would end up stuck when captured from atop of some objects. - Fixed an issue where some of the Players were seeing an incorrect score at the end of a match. - Fixed an issue regarding the flow of the game when a Player is disconnected at the beginning of a Ranked session. - Fixed an issue with the round time notification sound being played for the Defender team on Extraction mode. - Fixed an issue with Players not being able to open the TacMap and the Pause Menu after a network disconnection. - Fixed an issue with the minimap not showing the Drone's location when a Player spectates it. - Fixed an issue in Institute where Players were able to clip through one of the walls in the main building. - Fixed an issue in Oil Rush were bullets would act unpredictably near pillars. - Fixed an issue in Sub Factory where Players could fall from the upper gameplay area down to the lower tunnel area and get stuck. - Fixed an issue with some Arabian text-color settings appearing on one of the Tutorial pages. - Fixed an issue with a Keyboard button not appearing on the Character Customization page. - Fixed an issue that caused some players to remain stuck on Loading Screens if a Host Migration occurred during the Loadout page. - Fixed an issue on the Battle Crates page with the ESC button not being clickable. • Fixed an issue where the Ghost Profile was not being properly loaded. All players will receive an in-game t-shirt and patch to celebrate our 1st year anniversary. Players can access this gift in the Ubisoft Club. Fallen Ghosts Weapons: In our Extended Ops update, we made the Fallen Ghosts weapons pack from Ghost War available in our Campaign mode. With our New Assignment update, we have added even more Fallen Ghosts weapons exclusively to our Campaign. You can see the full weapons list here. Please note, these weapons will be unlocked for free for players with the Fallen Ghosts DLC. Alternatively, these weapons are purchasable via our in-game store. Battle Crate Icons: Battle Crate Icons, such as our Rainbow Six Siege Icons, can now be collected via our Ghost War and Spec Ops Crates. This means you can now customize your Ghost with Battle Crate Icons in both Ghost War and Campaign modes. Additionally, any Icons collected via Ghost War Crates before this update, are available for customization in our Campaign mode too. More information on our Battle Crates can be found here. -Fixed some display issues with the Fallen Ghosts weapons in the Campaign Loadout. Thank you so much, Ghosts, for your continuous support and feedback on Ghost Recon Wildlands. 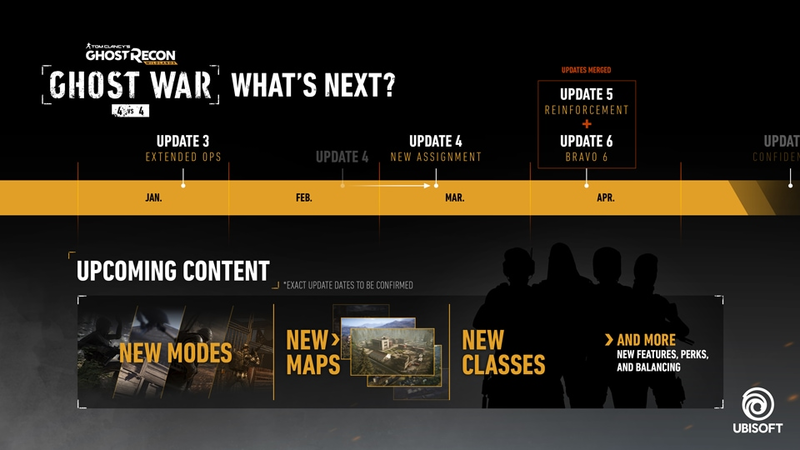 Please let us know your thoughts on this latest update on our official forums, and on Reddit. 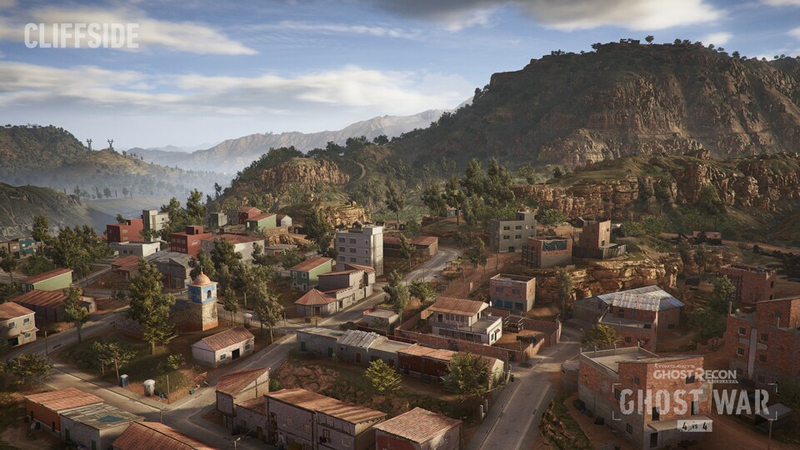 To learn more about Tom Clancy’s Ghost Recon Wildlands, please keep an eye on ghostrecon.com and visit our official Facebook profile. We invite you to join the discussion on Twitter using @GhostRecon and on our official forums and Ghost Recon Discord channel.